According to reports Rand wasn't too pleased with Pence who went to see Senate Republicans about Trumps emergency declaration. He said if Pence was still a congressman he would oppose the President's move. Pence disagrees and Rand brought up DACA as an example where Obama took emergency actions. Is DACA mentioned in Article IV like building the wall is? Rand brought up DACA as an example where Obama took emergency actions. What exactly does "emergency actions" mean here? DACA wasn't part of any of Obama's declared national emergencies. Also, DACA wasn't really taking action, so much as deferring action, well within the president's prerogative to determine how best to prioritize the use of the limited law enforcement resources available to him, it seems to me. It wasn't at all like what Trump is trying to do, spending money in defiance of the way Congress allocated it according to its constitutional authority. I also don't see anywhere in the article that it quotes Rand Paul saying it like that. Maybe he did and it's just not quoted, because I see how they quote Pence getting defensive about how this isn't like DACA right after they mention Rand's opposition. But to be able to see if what Rand said made sense depends on being able to see what he really said. Last edited by Superfluous Man; 02-27-2019 at 09:01 AM. You should replace your avitar with one that expresses your belief that Ron Paul is wrong. Last edited by Superfluous Man; 02-27-2019 at 09:33 AM. Get him a jug, a bucket, and a box of snickers. Last edited by PAF; 02-28-2019 at 08:35 AM. Mr. Pence faced some frustration from senators about Mr. Trump’s decision to make the declaration and the legal grounds for doing so, particularly from Senator Rand Paul, Republican of Kentucky, according to three people familiar with the exchange who asked for anonymity to describe a private meeting. When Mr. Paul argued that Mr. Pence, a former representative, would have opposed Mr. Trump’s use of an emergency declaration and compared it to President Barack Obama’s use of an executive order to establish protections for young undocumented immigrants under the Deferred Action for Childhood Arrivals program, Mr. Pence objected, according to one person. He argued that there was a difference between the two uses of executive power, according to two people. A spokesman for Mr. Paul said that the senator had raised concerns, along with other senators, about the declaration in an exchange, but did not raise the comparison to DACA. "Sen. Paul had a friendly discussion with the vice president, that if we do go down this path it will damage our ability to be considered the party of rule of law," said a Paul spokesman. IMO they need to re-survey the border, with a goal of half of the land being taken in Mexico. At least then "Make Mexico Pay for It" would have some meaning in real world terms. Crippling sanctions if Mexico landowners don't share the burden. Likewise, that would entail not only affecting private and business owners land, some of which have been owned since before this government was even formed, but also forcing them into another country. And, forcing another country to pay for something, ie; crippling sanctions, if they do not "share the burden"... are you sure you want to go that route, considering this is a RP forum, and opposes the NAP? 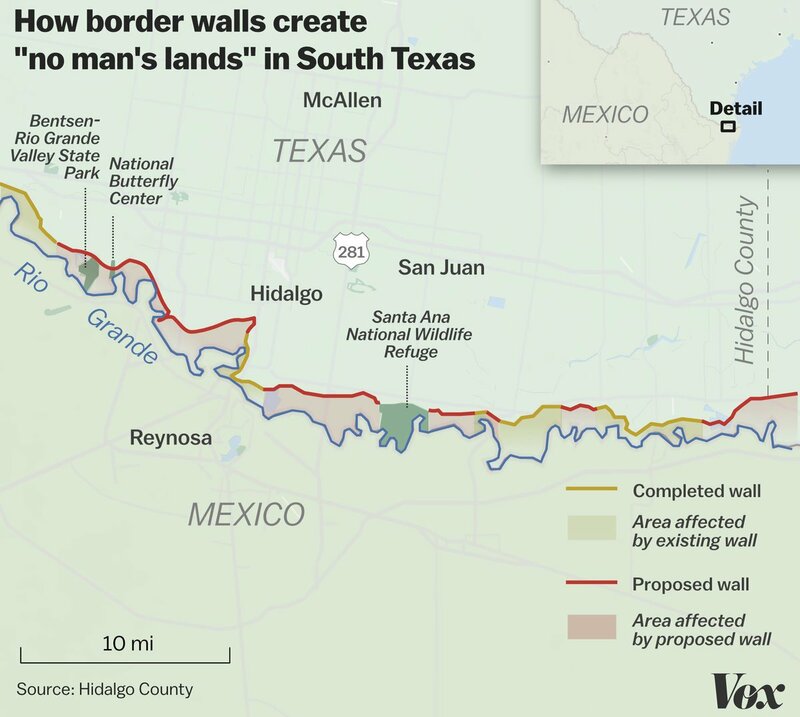 I'd be OK with giving any Mexican landowner (and immediate family) who winds up on the US side of the border wall US Citizenship if they want it. Fast track, no bureaucratic BS. That's as fair as I can make it. Full rights of a US citizen including the right to be elected president. So a Mexican born US President would be possible. Last edited by RonZeplin; 02-28-2019 at 02:13 PM. You DO remember that the president has to be a natural born citizen, right? Just being a citizen isn't enough, and for damn sure a citizen by declaration or statute of Congress doesn't meet the requirement. Yes you're right about natural born. Make them Naturalized US Citizens. No Mexican President, or anyone else foreign born, like GOP prez nominee Juan McCain of Panama. McCain Unleashes Fury on Rand Paul and Co.